The New York City Housing Authority development, which includes 12 buildings and houses over 4,000 residents, seems like a pretty quiet place to most passersby. Its Chinatown/Lower East Side location — bounded by St. James Pl., Madison St., Catherine St. and South St. — is just steps away from 1 Police Plaza, the headquarters of the N.Y.P.D. And according to figures put out by the N.Y.P.D., it might seem that relatively little violence — particularly gun violence — takes place there. The Fifth Precinct, which covers the complex, lists a total of only three reported shooting incidents in the entire surrounding neighborhood so far in 2013, according to reports published online. But that’s not what some residents of the public housing development say. This past week, one Smith Houses resident claimed that she’s heard gunshots within the project around ten times so far this year, and another said it’s happened around once a month. 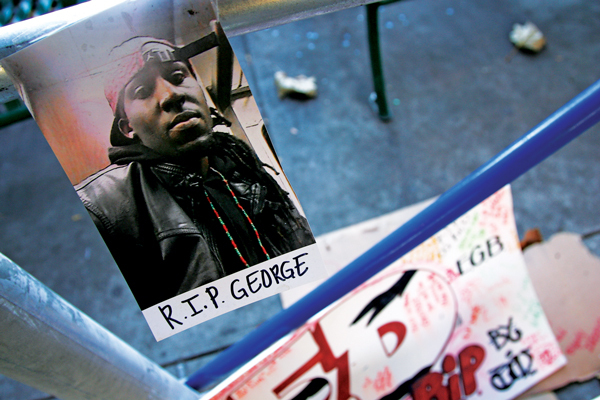 Early on Sun., Nov. 10, tensions at Smith Houses came to a head when George Taliferro, 30, was shot to death on a walkway between two of the development’s buildings at 7 and 15 St. James Pl. Around 4 a.m., in the dark before that day’s dawn, police found Taliferro lying in the courtyard, bleeding out, with bullet wounds in his torso. He was pronounced dead shortly after being rushed to the hospital. The prime suspect in that fatal shooting, Christopher Delrosario, 19, was arrested several days later in the upstate town of Port Jervis, after apparently trying to flee the area. He’s been charged with second degree murder and criminal possession of a weapon. Delrosario is a resident of 46 Madison St., in Smith Houses. Taliferro was raised in Smith Houses, and his family — both his older blood relatives and his three young children — still lived there at the time of his death. But according to those who knew him, Taliferro actually lived in a NYCHA development in Brooklyn. He’d gotten out of jail in August 2011, after serving over three years in state prison for weapons possession, according to the State Dept. of Corrections. He still sold a little marijuana on the side, according to a 60-year-old Smith Houses resident who said she’d remained friends with Taliferro after watching him grow up so many years ago, but that didn’t make him a bad person. “George was a good guy,” she said. Some at Smith Houses believe that Taliferro became the victim of a cross-borough turf war, one in which he’d never meant to get caught up. Others think that it was fiery disputes within the development that boiled over and led to his end. But it’s unclear exactly what happened on the morning of Nov. 10. A Fifth Precinct officer referred inquiries to Police Plaza, but spokespersons only provided the bare details of the crime. A 24-year-old woman who lives at 15 St. James Pl. said she was walking into her building that morning, around 3:30 a.m., and saw Taliferro sitting outside the building with a group of five or six other men. Half an hour later, four shots rang out. One missed; the other three struck Taliferro and laid him out, according to the Manhattan district attorney’s office. Even before Delrosario was arrested and charged with the murder, the woman said she and many of her neighbors were practically certain that the crime had been committed by a Smith Houses resident. “A lot of people around here don’t like each other,” she said. And although plenty of residents might even have thought that it was Delrosario that did it, most of them were too scared to talk about it, she added. The 60-year-old Smith Houses resident, who said she knew Taliferro ever since he was a kid, didn’t think the killing was just a random act of infighting. “It was definitely turf related,” she said, referencing the fact that, in her 35 years living at Smith, she has seen various turf wars develop between Lower East Side NYCHA residents and those living in public housing in Brooklyn, particularly around the East Flatbush area. The woman explained that, regardless of how quiet the area might seem to visitors, the knowledge of drug or gang-related violence keeps her and many other older Smith Houses residents in their homes after dark. Another older Smith Houses resident, an 82-year-old man who said he’s lived there for over four decades, echoed that sentiment. He enjoys sitting outside in the courtyard on nice days, but never past 5 p.m.
Across the courtyard, two 25-year-old men — friends who both live in the development — were walking out of their building towards the street. When asked whether or not they felt unsafe because of drug or gang feuds that might spill over into the complex, they said they didn’t — but mainly because they’re rarely ever around the neighborhood at night. Yet another Smith Houses resident — a man who said he knew not only Taliferro but his parents and grandparents as well — explained that tensions within the development, compounded by the 30-year-old’s violent death, were apparently painful enough to push them out of the place they once called home. “The day George died, his whole family moved out,” the man said, shaking his head. On the walkway between the two buildings at 7 and 15 St. James Pl., at the very site of the fatal shooting — and mere steps away from the home of the man alleged to have committed the crime — there sits a makeshift memorial to George Taliferro. After conducting interviews around the courtyard of Smith Houses, this reporter stopped in front of the memorial, first just to look at the image, and then to take a photo of it for this story. A young man, probably around 18 years old, walked up to the reporter and asked him what he was doing there. But he didn’t think that writing a story about the murder, or taking a photo of Taliferro’s memorial, was acceptable.